This Chipotle Chicken recipe is absolutely delicious! Perfect for food prep or family meals. As well as being absolutely cracking on the taste buds, our Chipotle Chicken is low calorie and high protein. This makes it ideal to pair with one of our savoury rice recipes. Place the chicken in a bowl with the chipotle paste and lime juice and season well. Toss to coat evenly. Heat the oil in the pan over medium heat for 5-6 minutes on each side, or until cooked through. Add the peppers, sugar snap peas and cook over for 5 minutes, or until tender and lightly charred at the edges. Mash together all the guacamole ingredients in a bowl until well combined and season with salt, pepper and chilli flakes. 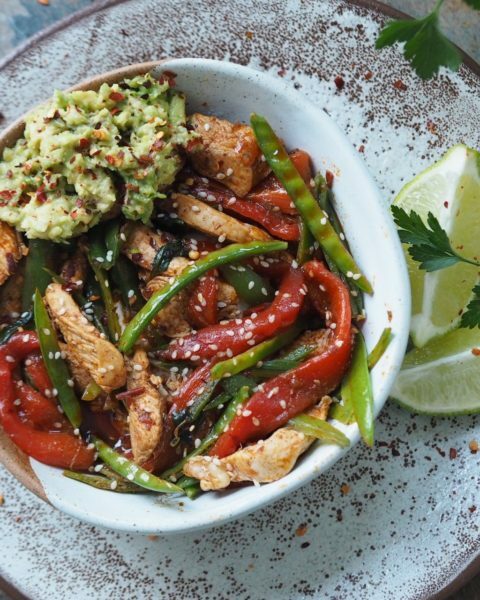 Serve the chicken and vegetables and guacamole in a bowl, top with the squeezed lime juice, paprika, sesame seeds and wedges of lime.